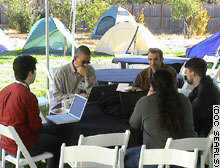 Foo Camp participants roughed it in tents, but they still had wireless Internet access. (Business 2.0) -- Stashed away in the rolling hills north of San Francisco, the town of Sebastopol, California, used to be remarkable for two things: Gravenstein apples (it was once the world's largest producer) and the Russian River appellation (excellent zinfandels). You can now add a third important growth industry whose roots are there: Foo Camp, a new breed of geek gathering organized (somewhat) by O'Reilly & Associates, a thriving technology publishing business. This year's Foo Camp, held in early October, was extraordinary for many reasons, but perhaps mostly for its structure -- or lack thereof. Tim O'Reilly, Foo's founder, made sure that basics like food, showers, and meeting space were available, but then quickly turned over the weekend's agenda to the geeks (literally -- there was no agenda until Friday night, when the attendees made one up on the fly). The idea: Get 200 or so smart folks with a lot in common together in one place at one time, let them pitch tents, toss in a Wi-Fi network, and see what happens. Turns out, quite a lot. At Foo, I was about as likely to bump into a founder of Google as I was a vice chairman of Warburg Pincus (both were there). Tim Bray, a co-inventor of XML, huddled with Yahoo engineer Jeremy Zawodny and Nutch founder Doug Cutting, and in no time they had posited a new approach to stopping spam (for details, head to www.tbray.org/ongoing/). Later, Zawodny teamed up with David Sifry, the founder and CEO of Technorati, a popular search engine for blogs, and others to propose a new way to organize the thousands of newsfeeds available from media outlets around the world. The new standard they hacked up, FDML, may well be adopted by major corporations and news outlets soon after this column hits newsstands. Simon Cozens, an author and programmer from England, presented Twingle, a program that helps you find things in your e-mail archives (who doesn't need that?). Also receiving good geek buzz was an application called Dashboard, which automatically scans and indexes your hard drive, then displays documents related to whatever you're working on. And there were two sessions on how peer-to-peer networks over broadband connections are about to dramatically change the way entertainment is distributed to the home (for more on that, search Google for "BitTorrent"). For relaxation, campers drank microbrews, tossed Frisbees, and disassembled a Toyota Prius, then put it back together again (it was a rental). Clearly, this was not your average technology conference. Talking with attendees, I couldn't help thinking that Foo was more than fun -- it was important, and not just to the characteristically self-involved lot who proudly wear the geek label. After nearly three years of nuclear winter in the technology industry, the folks who gathered in that Sebastopol orchard were ... well, they were happy again. Optimistic even. "It felt like we were poking our heads up out of the ice and seeing spring," noted Ross Stapleton-Gray, a security researcher. If the Foo folk are any indication, our precious resource of geekdom is once again charged up to tackle big problems and create world-changing applications based on trends like social software, ubiquitous broadband and wireless connections, and a newly rational environment for investment and finance. These people believe they can fix the spam problem and make sense of the overwhelming flood of information now available to corporations and individuals. They sense lasting and real economic models and see potential in nearly every problem they encounter. In other words, they are hard and happily at work moving the entire economy of the Web forward, to good end. Perhaps, I thought to myself as I drove home at the end of Foo Camp, it just takes a couple of days in the woods to realize that we are well on our way out of them.